this was our project for sunday! and yes it took the entire sunday, but it was definitely worth the effort! we bought a pork shoulder the day before and we had a ride through half of the city to buy some wood chips and then started our research on how to build your own smoker. while the man and the child had an extensive DIY-project to build the smoker and the pork got smoked in this oven for 5 hours, the yeast for the burger buns had time enough to proof and at the end we had a really excellent feast with what originally is called trash food. we had the pulled pork recipe from yvette van boven’s homemade winter, but unfortunately her instruction how to build a smoker is in her book homemade and not available online. we found something on kellieskitchen which inspired the man for his own construction. the smoker as such worked well, even if the wood chips smoldered only a bit, but, never the less, the pulled pork was fantastic! i also baked my first own burger buns. which should be perfect, following the source of vanillakitchen. well they were good, they did not disturb the pleasure of the pulled pork at all, but this could only be the beginning of my experiments for the perfect burger bun. preheat the oven to 140°C. build your smoker, following the book homemade or kellieskitchen. rub the meat with paprika, chili flakes, sugar and salt. 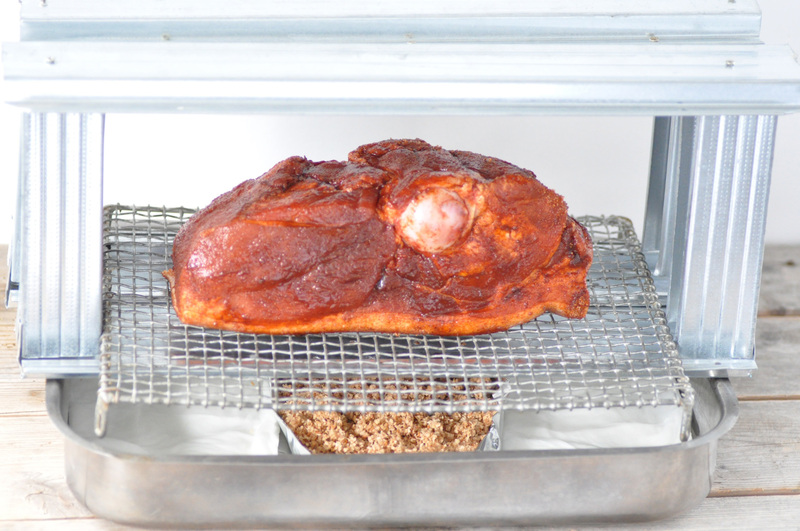 place the meat on the rack of your smoker, cover completely with aluminum foil. 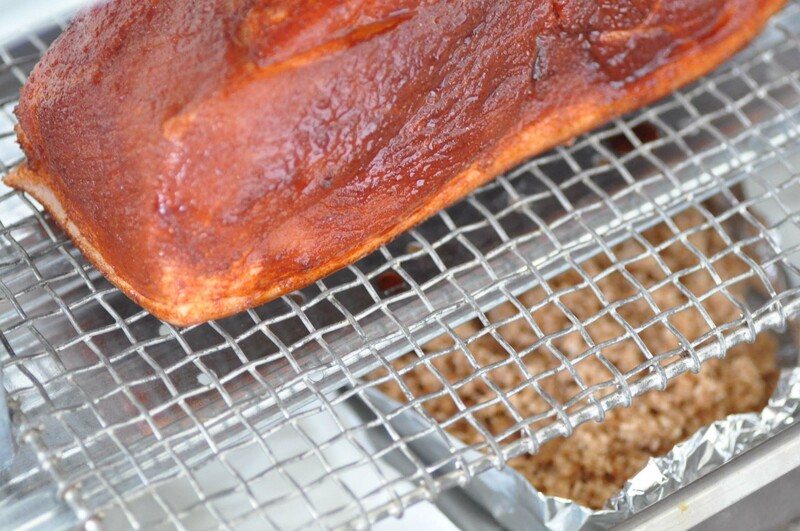 place the smoker over low heat until the wood chips start smoldering. then place the smoker in the oven and bake and smoke for the next 5 hours. meanwhile you can start your burger buns. peel the potatoes and cook until tender. drain off the water and add milk, salt and butter and mash until you have a fine potato puree. combine the potato puree, cottage cheese, one egg, sugar, oil and salt in a large bowl. add 300 g of the flour and the yeast and combine everything. add the remaining 250 g flour little by little and knead until the yeast dough is well combined and just a bit sticky. pour the yeast dough in an oily bowl, cover and allow to proof for about 45 minutes. knead again and divide the dough in 100 g portions each. form balls and allow to proof one more time for 5 minutes. place the balls on a baking tray, covered with baking paper. flatten the dough balls a bit and allow to proof for another 15 minutes. now the pulled pork should be done. remove from the oven and increase the heat to 160°C. combine the second egg with a splash of milk and brush over the burger buns. bake them until golden for about 20 minutes. 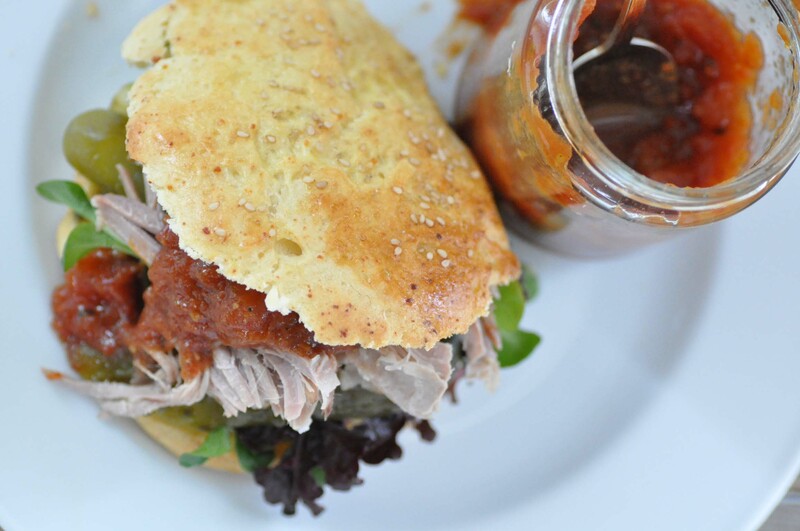 pull the meat with two forks (or your fingers) and enjoy together with the burger buns, mustard, gherkins, lettuce and tomato jam or ketchup and bbq-sauce. den ofen auf 140° C vorheizen. den räucherofen zum beispiel nach der anleitung von kellieskitchen oder homemade bauen. das fleisch mit paprika, chili, zucker und salz einreiben. das fleisch auf das gitter des räucherofens setzen und komplett mit alufolie einwickeln. den räucherofen auf kleiner flamme erhitzen bis die räucherspäne zu glühen beginnen. dann den räucherofen in den ofen stellen und die nächsten 5 stunden backen und räuchern. in der zwischenzeit können die burger brötchen gestartet werden. kartoffeln schälen und weich kochen. das wasser abgießen, milch, butter und salz dazu geben und stampfen bis ein schönes kartoffelpüree entstanden ist. in einer großen schüssel das kartoffelpüree, den hüttenkäse, ein ei, zucker, öl und salz miteinander vermengen. 300 g mehl und trockenhefe dazu geben und alles zu einem teig verkneten. nun die verbleibenden 250 g mehl portionsweise dazu geben und den teig kneten bis er kompakt und nur noch ganz leicht klebrig ist. den hefeteig in eine eingeölte schüssel geben, abdecken und 45 minuten gehen lassen. erneut durchkneten und in jeweils 100 g große portionen teilen. kugeln daraus formen und nochmal 5 minuten gehen lassen. die teigkugeln auf ein mit backpapier ausgelegtes blech legen, leicht platt drücken, mit einem küchenhandtuch abdecken und erneut 15 minuten gehen lassen. das pulled pork sollte nun fertig sein. das pulled pork aus dem ofen nehmen und die hitze auf 160° C erhöhen. das zweite ei mit etwas milch verquirlen und die burger brötchen damit einstreichen. etwa 20 minuten backen bis die brötchen eine goldene farbe bekommen. das fleisch mit zwei gabeln (oder den fingern) zerpflücken und mit den burger brötchen, senf, salzgurken, salat und tomatenmarlemalde oder ketchup und bbq-sauce genießen. This entry was posted in autumn, recipes, summer, winter and tagged lettuce, potatoes, tomato by The Cook. Bookmark the permalink.